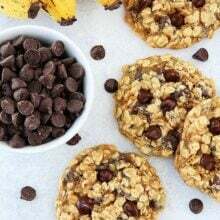 Every time I am in the mood to bake, I ask Josh for suggestions, he always gives me the same response, “make your oatmeal chocolate chip cookies.” They are really good cookies, a true classic, but I like to pretend my kitchen is a lab. I love experimenting with new recipes and ingredients. I get bored making the same recipe all of the time. 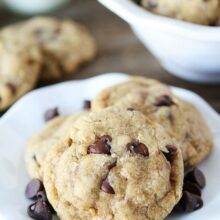 I decided to mix things up and use whole wheat flour to make chocolate chip oatmeal cookies. I wasn’t sure how the whole wheat flour would affect the cookies, but they turned out great! I think I love these even more than my standard recipe. The cookies were crisp on the edges and soft and chewy in the middle. The whole wheat flour added a slight nutty and wholesome flavor. – Sift together the flour, baking soda, baking powder, and salt in a medium bowl. Set aside. – Using a mixer, cream the sugars with the softened butter for about two minutes. – Add in the egg, vanilla, and milk. Mix until smooth. – Slowly add the dry ingredients into the wet ingredients, with the mixer on low. Mix just until flour disappears. Don’t over mix. 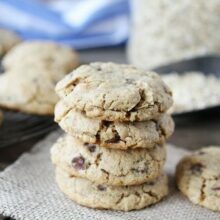 – Stir in the oats and chocolate chips by hand. – Form rounded cookie dough balls, using about 1 T of dough. Place dough balls on a cookie sheet lined with parchment paper or a Silpat. – Bake cookies for 11-12minutes or until lightly golden around the edges. Let cookies sit on the cookie sheet for a couple of minutes to set up. Then move to a cooking rack. Makes around 2 dozen cookies. Making these now….Just ate one out of the oven they are awesome! Added some pecans to 1/2 the batch. I loving them! I googled for healthy chocolate chip cookies and found your recipe in the results list. I selected yours because it had a reasonable amount of sugar and fat, and everyday ingredients 🙂 So often you find “healthy” recipes and they might reduce the fat, but they add a boat load of sugar. Yikes! I only have one type of flour in the house, and that is whole wheat, and it’s usually Bob’s Red Mill. I try to keep ingredients/products to a minimum to save money, save shelf space, and reduce waste and anxiety. I haven’t used white flour in decades. I make bread, cakes and cookies all with whole wheat. Holy yum! Made these yesterday and boy were they so good! Next time I am going to cut the sugar a bit. Thanks for the great recipe! Looks simple enough going to try this soon. Just made these and they are SO good! Will definitely be making these again! I made these cookies for a group of people that probably NEVER eat anything with whole wheat flour and they loved them! They are delicious! I’m pretty sure I will never try a new oatmeal cookie recipe again. This one is perfect! what “speed” are the oats that you use? old-fashioned? quick? I would think it might make a difference in the texture. thanks! Amazing! 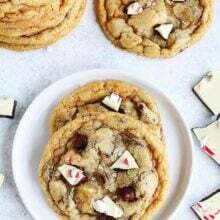 Mine turned out to be little fluffy chocolate chip cookies that just happened to have oatmeal hidden in them rather than oatmeal cookies with chocolate chips, but it was a great blessing in disguise! My family ate their “chocolate chip” cookies happily and didn’t have one complaint about the whole wheat or oatmeal. It was great to sneak a little health (comparatively anyway) into some of their favorite cookies! Great recipe!! Great cookies!! Thank you for sharing. AWESOME…. I just made these and son and husband LOVE THEM! Just made these and they were delicious!! Thanks for a great recipe! what is 1T milk? Thanks..I am planning on making these over the weekend..: ) reviews are AMAZING ! I mean, is it 1 tablespoon?? These are delicious! I doubled the batch and only put 1/2 c white sugar. Perfect sweetness for me. Also only did half the amount of choc chips. I love how they puffed right up, must be from the baking powder. Yum! Will make again and again! Sorry I should add that I still put the full amount of brown sugar in too. So glad you liked the cookies. They are a favorite at our house! Omg, these cookies are delicious! I didn’t have chocolate chips but I did have white morsels so I used them. If the white morsels taste this good, I can’t imagine how good they’d be with chocolate chips! Yum! Definitely saving this recipe! Glad you liked them! I will have to try white chocolate next time. Great flavor, easy to make!